So yesterday Volare opened to the public after it's glitzy opening night on Sunday. I managed to go for lunch with a friend on their first day and here's my brief review in a word: Good! 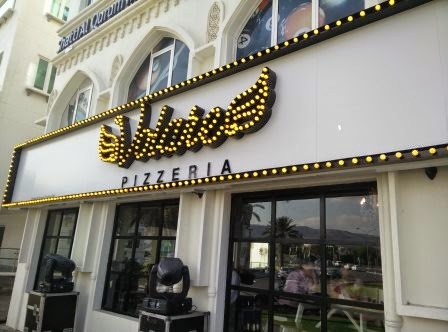 The pizzeria is situated across the road from al Masa mall, next to Love at first bite - over looking the roundabout that you'd have to go around to get to the Shatti cinema. Considering they have just opened, they've yet to sort out their electronic payment system and so it's cash only just now - I'm sure that'll change very shortly. We got to the place just after 1pm and walked in to find the place absolutely empty - no other customers at all. We picked a table for two and sat down and were given a menu each. The menu was fun, with lots of fun names for various dishes but it, at least for me, was a bit cumbersome to read through - you open this leather box and then pull out a clipped bundle of papers, which don't turn too easily, and so you're spending more time battling with the pages than looking at the menu - at first anyway. Pricing is at the higher end of the pizza in muscat scale and is obviously intending to compete with Pizza Express as opposed to Papa Johns. Pizza's come in three sizes, and prices range from RO 3.9 to RO 8.9, depending on what you order and which size. 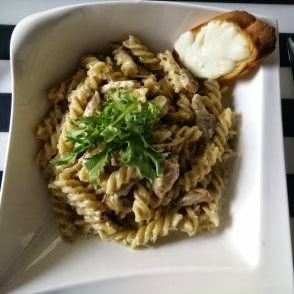 Pasta dishes are between RO 5 and 6 per serving as well. We ordered a medium pizza with an extra topping, and a pasta dish along with a bottle of water. The speed of service was pretty good, we had the water within a couple of minutes and the food came after about 15 minutes. The pizza was good, really really good. Thin and crispy and incredibly tasty - and according to a true-blue Roman I was discussing this with last night - that's how pizza should be. 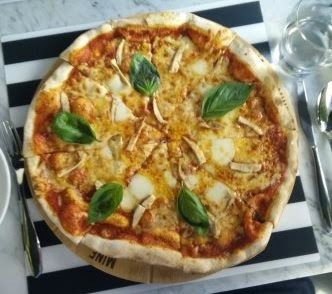 It's the best pizza I've had in a restaurant in Muscat - the best pizza I've had here was made by friends, but thats another story! The pasta was ok - I found it a little greasy, but generally pretty good - but nothing to get excited about - certainly not in the same league as the pizza. The decor of the restaurant is fun and I guess what some might call edgy? I liked the music playing and I liked the staff's uniforms - there was a hint of New York gangster style going on I think. 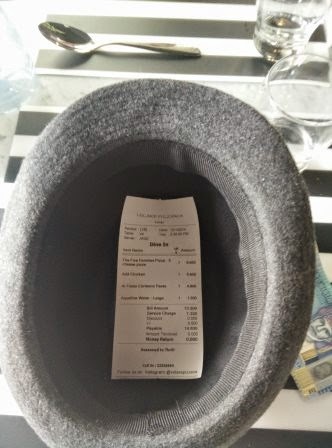 This theme extends from the decor and the uniforms right to ordering the bill... the last page of the menu has a phrase in Italian that we were asked to say so that we could order the bill - which came in a hat! The price was RO 14.630 including service charge, certainly at the higher end of the price scale - but for a once a month pizza trip - worth it (for me) I think, the pizza really was good. Volare has a facebook page here, and you can call them on 2232 6664. They're open Noon till midnight every day.